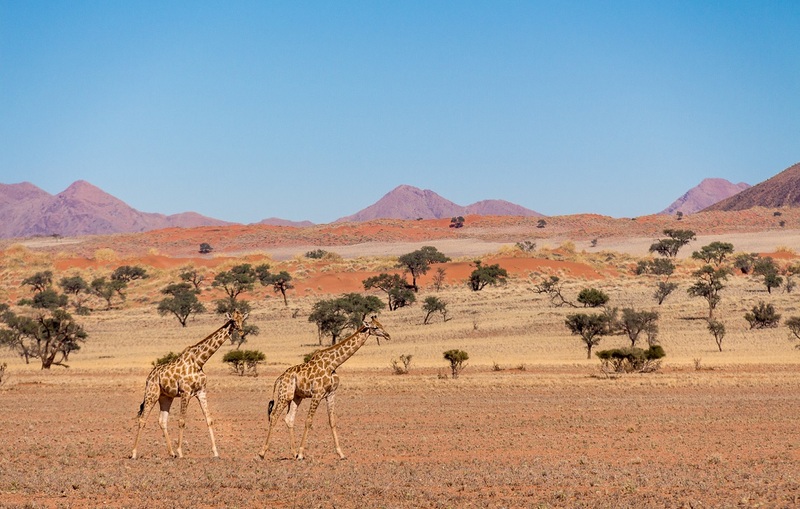 Namibia is a laidback destination drenched in culture, timeless landscapes and atmosphere – perfect for slow travel. Here are six places that will reward you for spending more than a night. Often, people rush their visit to Sossusvlei. They arrive in the afternoon, scramble up a dune the next morning and head off somewhere new by lunchtime. 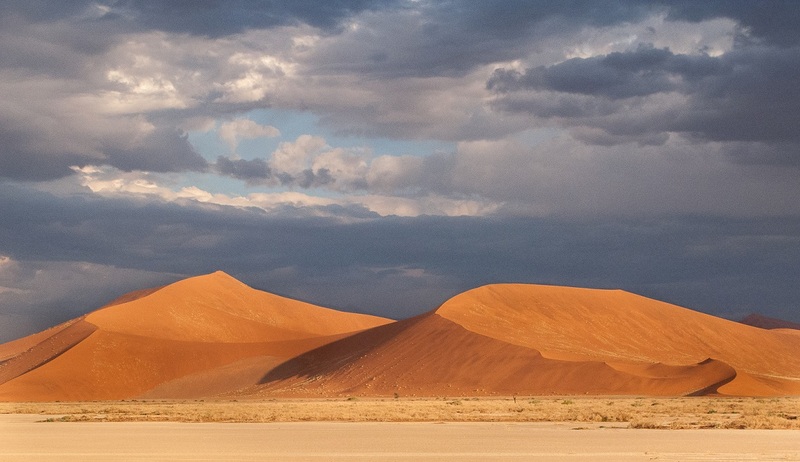 Here, in this part of the Namib-Naukluft Park, some of the dunes are 80 million years old. So, why not appreciate them in a timeless way? 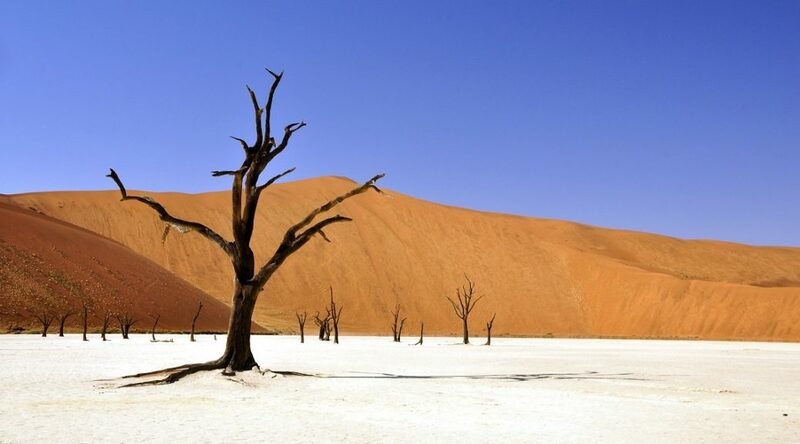 Climb a dune like Dune 45 or Big Daddy, then slowly soak up the sight of the white clay pan of Deadvlei with its camel thorn skeletons. T4A travel tip: Don’t miss exploring Sesriem Canyon on foot. Shaped by the Tsauchab River, parts of it are 65 million years old. Other highlights are watching sunrises and sunsets against a backdrop of ancient dunes, and star-gazing in clear skies. If you have deep pockets, hot-air ballooning at dawn is a surreal and soulful experience. Surrender to a sense of serenity in this 200,000-hectare private nature reserve that shares a 100km border with the Namib-Naukluft National Park. Think red sand dunes, golden-yellow plains and lilac mountains. The Family Hideout offers two off-the-grid campsites at least a kilometre apart, so it’s like having the whole place to yourself. Indulge in some stargazing in this Dark Sky Reserve, explore a 4×4 route where you can see game and the mysterious fairy circles of the Namib, and go dune-boarding or hot-air ballooning. No 4×4? Go on a dune drive with a guide. T4A travel tip: For a really special adventure, book a three-day walking trail in the reserve with Toktokkie Trails. Giant granite boulders explode from the flat plains and caves, arches, a rock pool and other rock formations beg to be discovered. A community-run campsite gives you a chance to meet the locals, have a drink or meal at the bar, and camp in stunning rocky enclaves. Watch sunset paint the koppies with gentle pinks and yellows, and the stars begin to shine in the clean, dry air. T4A travel tip: If you’re energetic, knock yourself out with hiking and climbing. Gross Spitzkoppe – aka the Matterhorn of Namibia – is a popular climb. You can also hike to a lookout point and see some of the 40 rock art sites. Hiring a local guide is mandatory, and a good way to give back to the local community in the true spirit of slow travel. This coastal town is popular for its beaches, relaxed atmosphere and cooler temperatures, thanks to the ocean breezes. There’s a wealth of attractive old buildings dating back to the early 20th century, many with German Jugendstil influences. 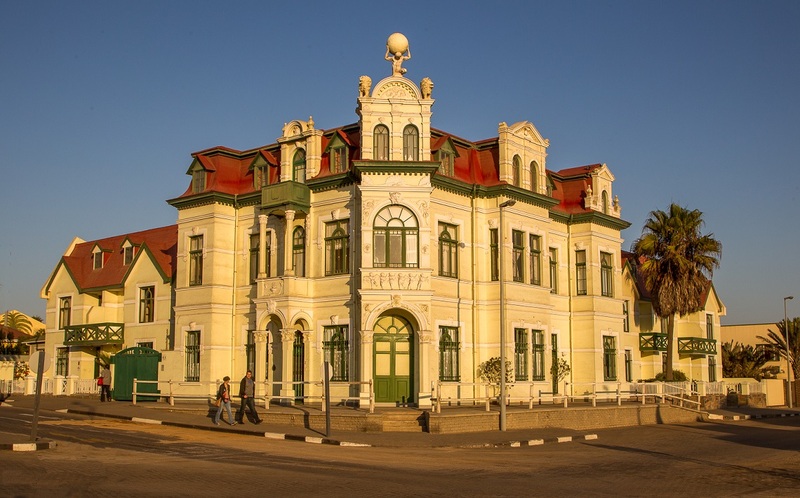 Swakopmund is the adventure capital of Namibia, offering horse trails, quad biking, microlighting, sand boarding, sky diving, paragliding, fishing and hot-air balloon trips. T4A travel tip: Get a permit from the Ministry of Environment and Tourism office to drive a 140km route just outside town to see ancient welwitschia plants, succulents, lichen fields and moon-like landscapes. Find out more about the Welwitschia Plains 4WD Trail here. Etosha is one of my favourite places in Southern Africa to see wildlife. Although Okaukuejo is madly popular for its waterhole, where there’s 24-hour viewing, it’s full of overlanders and too frenetic for my taste. Far more relaxed, with enough good waterholes nearby to justify a longer stay, is Halali. It’s less busy, has nicer campsites and the superb Moringa waterhole [pictured above] is just as rewarding as Okaukuejo’s, yielding sightings of elephant, black rhino, maybe even leopard and spotted hyena. T4A travel tip: Namutoni in the east has a white fort built in the early 1900s and a number of excellent waterholes in the area. 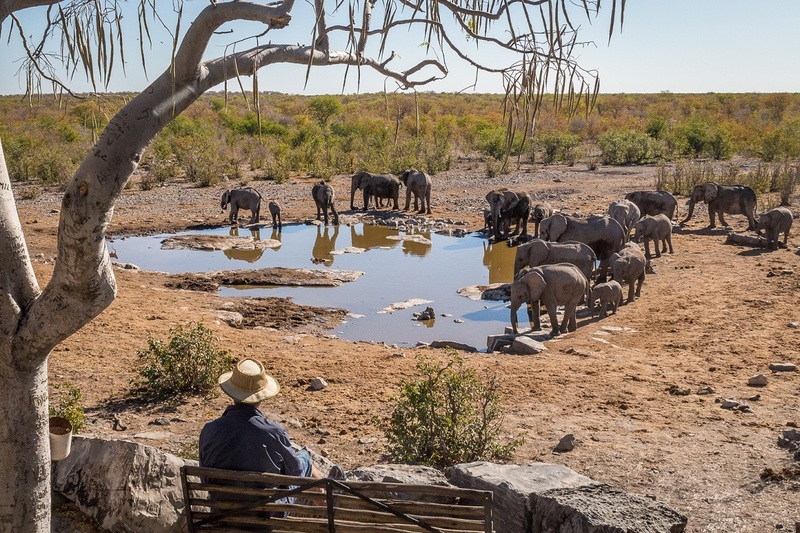 If you have just five nights for Etosha – and why would you go for less? – I’d recommend one at Okaukuejo just to experience its in-camp waterhole, then two at both Halali and Namutoni. For diversity, leave the Namibian deserts behind and explore the Kavango, Kwando and Zambezi rivers and floodplains. Here along the Angolan and Zambian borders, the sunsets are spectacular, the river cruises rewarding, and there’s a chance to learn about local culture from fascinating Living Museums. Birding is excellent with an abundance of fish eagles, African jacanas and bee-eaters. You may spot wildlife like waterbuck, elephant and hippo along the rivers, and rafts of water lilies. T4A travel tip: The main road from Rundu in the west to Katimo Mulilo in the east goes through the Bwabwata National Park. You can make detours into sections of it, like the Mahango area and Popa Falls near Divundu. For campsites worth spending time along this route, see six cool campsites in Northern Namibia. Find more about author Roxanne Reid’s African travels on her Africa Addict blog.